It’s been a rough week battling with both day job, game and also a massive cold (which seems to be winning…), but there’s been some Atmocity progress nonetheless. Like the past few weeks, a lot of focus is currently on systems work and finishing up features. A lot of work this week went into finishing up the connectivity system in its current state. This will need some further tweaking further down the line when I’m done redoing the roads and the road system (more on that further down). 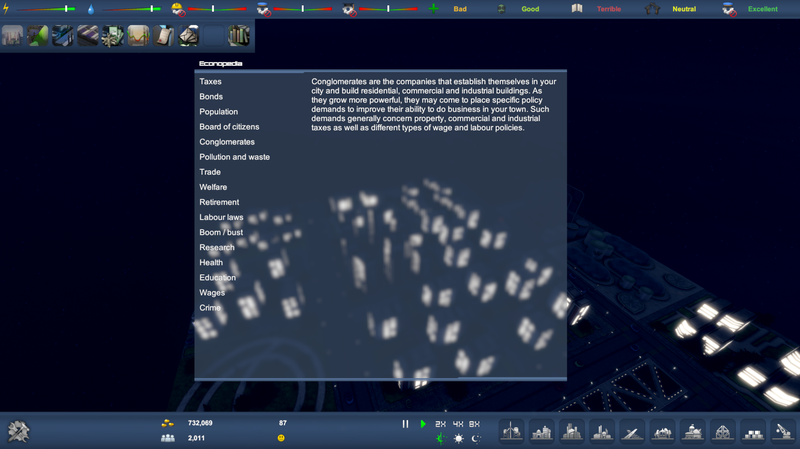 The connectivity system now finds the divided sectors of the city, tests connections between them and then groups connected sectors into units. These units can then be used to calculate production and consumption. Something that has been on my mind a lot recently has been to lower the grid size yet again. Those who have followed the game for a longer period of time, know that this has been done once before. 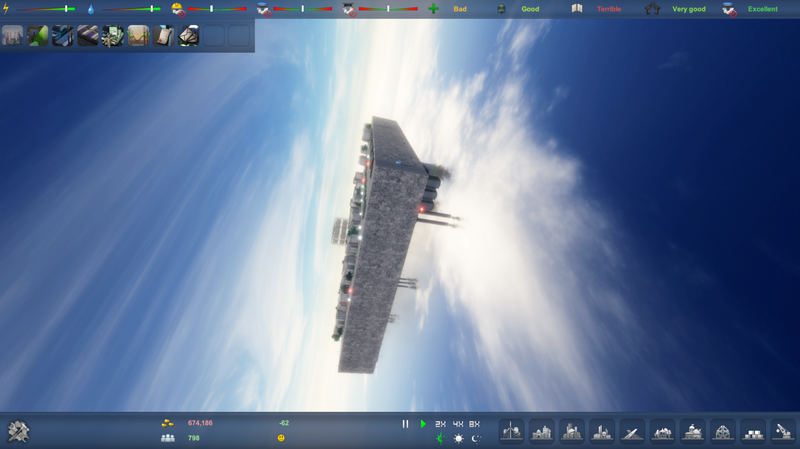 Then it was done to get rid of the blocky look of the game as well as to get roads in. Had the grid remained the same size, roads would have become gravely oversized. Over time, I’ve started feeling roads are STILL oversized. This coupled with me now thinking about what will go into the game once all the main buildings are finished, has prompted me to cut the grid size down even more. This will allow roads to be smaller, buildings to be placed with greater detail and with smaller offsets, and the introduction of a lot of small decoration tiles etc. once all the main structures are finished. This will increase what players can do in terms of city customization and decoration. Here’s the smaller grid size in action (roads not adapted yet). 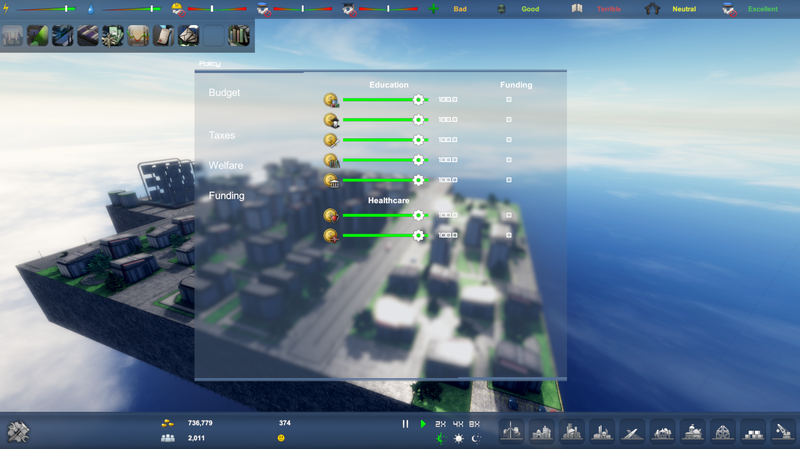 Following last week’s policy system overhaul, I’ve now started adding in new policy options faster. 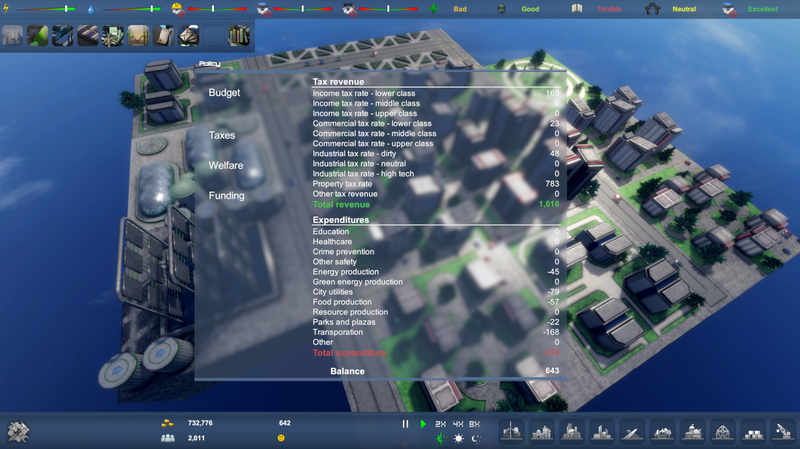 For the upcoming week I’m hoping to have a whole set of funding options added, so that players can control the funding for different types of educational facilities and healthcare for example. I expect most of the early-access version’s policy will be done for the 0.46 version (which has been moved from the 6th of February to the 17th due to revamped systems not being quite ready, but more features will be included). I’ve received more feedback from testers, a set of bugs have been found as well as some QoL features have been suggested. These include tweaks to controls and placement of panels etc. Aside from this I’ve also started working on some QoL features that I’ve been thinking about myself. 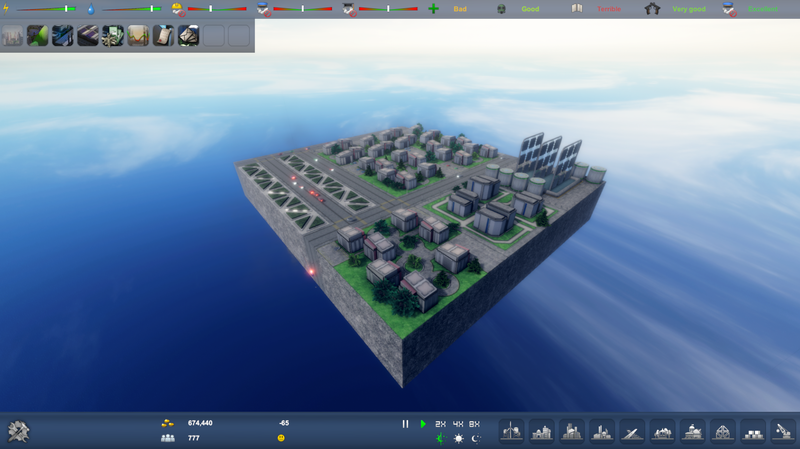 Among them is a range display when placing buildings. All buildings perform a vicinity test when built to check if there are any good or bad buildings nearby. 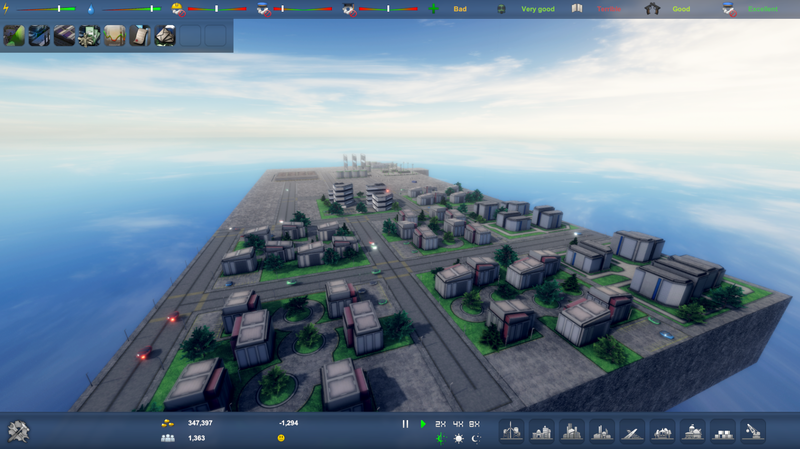 The range display will show the spherical range of buildings as well as light up what good and bad buildings will be within range when placed. Lastly, I’ve gotten the mid tier industry finished. The mid tier industry is less pollutant (only has marginal pollution). When finishing these buildings, I decided to split industry into three different types so they can be managed differently in the vicinity check. Dirty industry is disliked by all residential and commercial zones. This mid tier industry (called neutral in code, even though it isn’t quite) can be accepted by lower class and lower middle class residences and commercial zones. The high tech industry can be accepted nearby by middle class and upper middle class residential and commercial zones. The upper class residential and commercial zones are very picky, so they don’t like any nearby industry at all.